The nOb is a very simple idea — so simple, in fact, that I’ve seen more than one idle social media commentator dismiss it as an overpriced scroll wheel. They’re wrong, as I’ll explain, and thankfully sufficient people were able to see its potential that it was funded via a successful Kickstarter campaign. The idea has now been executed beautifully, with far greater sophistication than the device’s simple-but-elegant appearance suggests should be the case. Conceptually, the hardware acts in a similar fashion to a generic mouse scroll wheel, in that the main control is a rotary encoder that operates on whatever’s beneath the OS’s mouse cursor. That might be a fader, a knob, a text field, a waveform, a window... Essentially, anything you’d normally control via the click and drag of a mouse can, potentially, be controlled by the nOb. This means you have access to more of your DAW’s parameters than via a typical MIDI controller. But at the same time, it offers much more than conventional control via a mouse’s scroll wheel or click-and-drag operation. And that’s even before you introduce the nOb Assignment Centre (nAc) software, for Windows 7 and later, and Mac OS 10.9 and above — I’ll cover nAc in more detail later on. 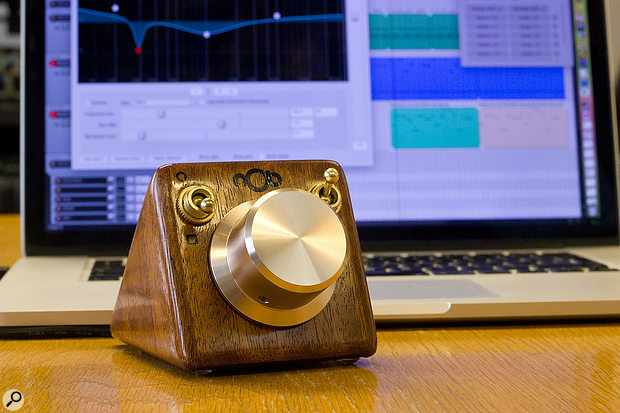 The nOb is, in fact, an Arduino device that’s housed in a beautiful, varnished, triangular, wooden block. It sits on four small non-slip rubber feet on one of the triangle’s two long sides, making it slightly deeper than it is tall. A USB cable trails out the back, and when hooked up to your Mac or Windows computer via this cable, the nOb should be detected automatically, offering its default functionality with no user configuration or software required. The front panel is dominated by the large, round, light copper knob, whose physical resistance can be adjusted by a tiny screw hidden in a deep recess in its side. Above this but, importantly, within easy reach of your fingers when turning the knob, is a pair of toggle switches, one on each side. These are the only hardware controls but all three are touch-sensitive, so they can be used in combination to assign different functions to the knob: double-tapping a switch can change the knob’s behaviour, as can touching one while turning the knob, and double tapping the knob provides an undo/redo facility. By default, the top-left switch toggles between two modes: in the down position, rotating the knob moves whatever’s under the cursor and the cursor stays where you move it; when up, once you take your fingers off the knob, the cursor returns to where it started. That could potentially be helpful if, say, you want to record fader automation and have the fader always return to unity when you’re done. Touching this toggle as you begin to turn the knob suspends dragging, allowing you to scroll the cursor to another control. I found that useful when, for example, adjusting the position of adjacent clips or warp markers, or moving from one mixer channel’s fader to the next. The other toggle’s position sets the cursor’s default direction of travel (vertical or horizontal), and touching it while turning the knob temporarily inverts that selection. This is great for controlling an EQ plug-in’s ‘node’, as you can quickly switch between one-handed control of gain and of frequency — and could just as easily use X-Y pads with precision. Some other intriguing, albeit more niche operations are explained in the PDF user guide. I won’t dwell on them here, but you can, for instance, set the knob to move the cursor in circles, in a square pattern, or diagonally. Perhaps the nOb’s most important feature, which I’ve mentioned briefly in passing, is its precision, which is greater than that of a scroll-wheel or a typical MIDI fader or continuous rotary encoder. In fact, it gives you the same precision as clicking and dragging with a mouse/trackpad, but with much better physical precision. That’s because using your fingers to turn a high-precision encoder like this gives you much better control than using your whole arm to control a mouse position, whereas with a trackpad there’s the problem that when you get the cursor right where you want it, there’s often a further small movement just as you lift your fingers away. (a trackball is better, but I still find them fiddly when reaching for the buttons!). By way of example, when using the nOb to control a track fader (set at the default height in a new Cockos Reaper project), the smallest increment I could move the fader up from unity gain was +0.17dB, whereas a very careful two-fingered swipe of my MacBook Pro’s trackpad (the gesture for its scroll function) couldn’t manage to move the same fader up less than +0.82dB. That’s quite a difference. 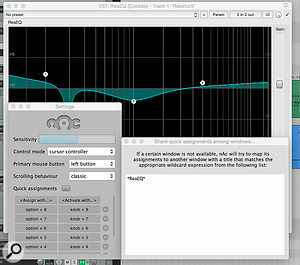 Controlling an instance of Reaper’s ReaEQ, my trackpad’s scroll function was assigned by the plug-in to control bandwidth — I had to click and drag to use the trackpad for this — whereas the nOb could apply gain in 0.1 and 0.3 dB increments; using this plug-in’s dedicated slider to control the band’s gain, the trackpad-swipe could only manage increments of 0.7dB. Also, note that unlike with a MIDI controller, if the GUI you’re controlling is stretchable (as with many plug-ins and DAW channel faders) then increasing the GUI size allows even greater precision. A long fader would make the nOb an ideal candidate for, amongst other things, recording multiple passes of detailed lead-vocal automation. None of what I’ve described so far requires you to use the nAc software — but as nAc can make the nOb much more impressive, I strongly recommend that users download and install it. Essentially, Quick Assignments are a sort of combination of a learn facility, keyboard shortcuts and cursor-movement memory, and they allow the nOb to move the cursor between parameters with little more than the press of a key. You can make as many Assignments as you wish via a pair of text columns in the software and, as I’ll explain, the designers have thought hard about how to avoid all these shortcuts clashing with those of your DAW. A common scenario which illustrates how Quick Assignments work is configuring the nOb for pan and fader control in a DAW’s mixer. You’d click on each fader in turn, and hit a key combination that you’d defined that tells nAc to store the position of the cursor. For example, you might assign Option+1, Option+2 and so forth to return the cursor to different track fader controls, with the number corresponding to that of the track, and Cmd+1, Cmd+2 and so on to the same tracks’ pan controls. The software remembers not only the cursor position, but also the mode of the nOb when storing the Assignment — so (depending on the nature of the control) you’d probably set it to horizontal when mapping an Assignment to a pan control, and vertical for a fader. You also define a recall shortcut for each Assignment, which will take your cursor back to the desired position. This could mean creating a lot of shortcuts, obviously, and as nAc takes precedence over other applications, this approach could potentially render some DAW shortcuts unusable. To get around this, nAc recognises the hardware’s knob as a modifier key; so if you use knob+1 instead of Option+1 to zap the cursor back to track 1’s fader, for example, this couldn’t override any DAW shortcut. Quick Assignments don’t only recall the cursor position, though — they also remember the window that is in focus. Thus, recalling a preset brings the relevant application/window into focus (the window must be open, but it can be minimised or hidden from view). As this system uses the OS window name, Nob Control have taken the opportunity to add another thoughtful feature: user-defined ‘wildcards’ allow you to use a single set of Assignments to control different instances of the same plug-in. Going back to the ReaEQ example, I could have this plug-in inserted on several different tracks. I’d open one instance and assign nOb shortcuts to control each of four bands. In nAc, I’d add the wildcard expression “*ReaEQ*” (meaning any window including the block of characters ‘ReaEQ’), as shown on the screenshot. And then, as long as I leave this plug-in’s stretchable GUI the same size for each instance and they’re configured with the same number of bands active, my Assignments would control whichever instance was open — there’d be no need to reassign Quick Controls for each instance. (If multiple instances are open, there’s an order of precedence, with the instance to which you assigned the control ranking highest, and the last-tweaked one next). Rather than set up too ambitious a list of Assignments, I tended to stick to only a couple of modifiers and my MacBook Pro’s number keys; this made mapping them to different functions quick and easy, with little risk of forgetting the shortcuts. But you could, if you wished, set up something much more sophisticated, or something easier to remember if you’re going to use it a lot — eg. assigning knob+G for a guitar-bus fader, knob+V for vocals and so on. I experienced a small number of nAc crashes. In fairness to Nob Control, I was pushing things deliberately, making many rapid adjustments and switching between Assignments in different applications, to see if the software would cope. It wasn’t a ‘real-life’ test, there weren’t enough crashes to consider it a significant problem, and if nAc crashes it doesn’t impact on your DAW project (reloading nAc brings the nOb back into use). Nob Control tell me they’ve received very few crash reports, but that they take them very seriously, will investigate them and will update the software accordingly. Still, I need to mention it here because when nAc crashes it doesn’t recall the Assignments you made since it was last saved, and the current save facility isn’t obvious; settings are saved when you close the nAc window. We’re still on v0.1, though, so it’s very early days, and there are plans to introduce a better auto-save very soon. The couple of minor issues I’ve described are more than offset by what works well, and while further software enhancements may be welcome the nOb/nAc combination is already a powerful, wonderful product for controlling your DAW software — or for controlling NLEs and imaging software such as Photoshop, for that matter. All things considered, then, the asking price isn’t bad. I’ve not had the space for a detailed exploration of everything that’s possible, so do also check out Nob Control’s videos on their web site, and for news of updates to the nAc software too. But hopefully you now have a better feel for what a nOb can do for you. Plug-and-play simplicity if you wish, but the nAc software gives you much more sophisticated control options. Greater precision than MIDI controllers or mouse scroll-wheels, and better physical control than click-and-drag. Quick Assignments allow near-instant control not only of multiple parameters but multiple applications too. A quit and reload are (currently) required to save your nAc software settings. This compact, stylish device is capable of far more than a first glance suggests should be the case and, used alongside a mouse/trackpad, could prove an indispensable partner to your DAW. €199 (about $247 when going to press).